I’m delighted to be taking part in the blog tour for Keith Van Sickle’s second collection of anecdotes about his part-time life in France, ‘Are We Nearly French Yet?’ Like its predecessor it’s wonderfully funny and full of wry observations about his host nation and the idiosyncrasies of its people that make them so very fascinating – and French. 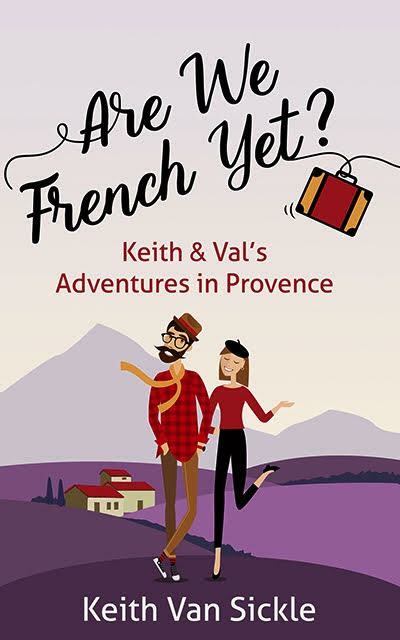 Keith and his wife Val continue to encounter baffling behaviour, vexing vocabulary and French frustrations of various kinds, but with good humour, slight puzzlement and impeccable American manners take it all in their stride. I have an excerpt to share with you, and you’ll quickly see for yourselves how entertaining and enjoyable this book is. The first time we stayed in St-Rémy, Madame introduced us to her favorite butcher. She’s known him for decades and put in a good word for us. It helps to have connections. The shop is run by a husband and wife who take great pride in their work. When you order a piece of meat, the butcher asks how you’ll prepare it. He cuts off any extra fat, trims around the bone, and cuts it into the size you want. If you want hamburger, he takes a piece of beef, runs it through his grinder, and forms it for you while you wait. Patty by patty. And he offers homemade goodies like paté, salami, ratatouille, stuffed vegetables and at least four kinds of sausage. The butcher’s wife dishes out these prepared items and runs the cash register while the butcher handles all the cutting. If you are a local, the butcher and his wife will take the time to chat with you. How’s the family? How are your bunions? How will you prepare the stew? For how many people? And then there’s the salt discussion. “Do you salt your food?” the butcher will ask. “Yes, but not too much,” the customer will reply. Once we came in to buy a couple of slices of paté en croute (paté in a pastry) but the customer before us had just bought some. The butcher’s wife decided that the remaining log was too small to cut us two nice pieces, so she went to the back room to find a new one. That took a while. Then we decided to order a few other things and that took a while longer. Finally it was our turn to pay, but the customer after us was a very old woman and the butcher had just finished serving her. Of course we let the old lady pay first so she didn’t have to stand too long. “Please go ahead, Madame,” Val said. She fished around in her purse for a while and finally found her wallet. Then she slowly counted out the exact amount, coin by coin, and all we could do was wait patiently. When the old lady finally finished, we were ready to pay but then the phone rang—someone wanted to place an order for Sunday. This led to a long discussion between the person on the phone and the butcher and his wife. How many people did she need to feed? What seasonings would she use? Should she pick it up at 11:00? No, maybe 12:00. No, 11:00 would be better. Finally they settled on 11:30. And you wonder why it takes 45 minutes. So is Keith nearly French yet? Judging by how he now knows how to correctly interact in a doctor’s surgery and has sussed out what fonctionnaires actually do (or some would say, don’t do) then he’s well on his way! 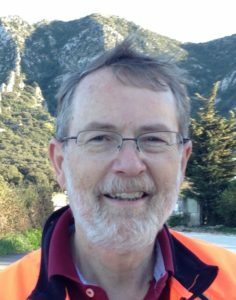 Val and Keith turned their lives upside down when they quit their jobs and moved to Provence. But they wondered: Can we fit in? And maybe become French ourselves? One Sip at a Time: Learning to Live in Provence. Keith later backpacked around the world on his own. that made him fall in love with Europe. Thanks for posting, and for sharing your opinion of the book. Definitely excellent on the topic!